On January 27, sixteen Primetimers enjoyed a meal together at Pappas BBQ and attended a heartwarming play. The show, Lost in Yonkers, set in Yonkers, NY in 1942, was performed at College of the Mainland. A special point of interest for us was the Director of the play, Jim Hackett, son of our own Primetimers Marilyn and Jim Hackett. We all agreed Jim did a great job casting and directing this dramatic comedy. 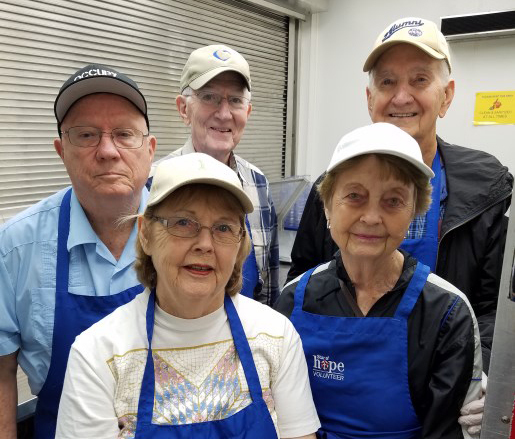 On March 10, Primetimers had the great experience of volunteering in a soup kitchen at Star of Hope in Houston. Many Primetimers donated clothing, towels and sheets, diapers, and toiletry items or wrote notes of encouragement at the request of the staff at Star (Debbie Hampton’s WBS class wrote over 70 cards!). When we arrived at Star, we were greeted warmly by the staff, and they expressed their thanks and appreciation.